At TU Delft, a prototype of a ‘circular kitchen’ has been developed, which has a significantly reduced impact on the environment. The kitchen will be presented on Thursday 17 January. The kitchen consists of easily-adaptable modules made from high-quality, environmentally-friendly materials. This makes it easy to produce simple variants tailored to individual preferences. Although the high-quality materials mean that the kitchen costs more initially, the fact that it is so long-lasting makes it equally expensive in the long term, with a much lower environmental impact. Scientists and market players joined forces to develop the prototype. Over the last two years, TU Delft and the Amsterdam Institute for Advanced Metropolitan Solutions have been collaborating with kitchen manufacturer Bribus, various providers of rental housing, ATAG and the Dirkzwager Groep. The designers of the circular kitchen have focused their efforts on a kitchen for the rental market that could be of interest for housing associations. A service and return guarantee would then ensure that the property owner has full peace of mind. The project started just two years ago. “Although we still have improvements to make, this prototype demonstrates that a circular kitchen is possible. We expect to be market-ready in around three years,” says Bas Jansen, who has worked on the project as a doctoral candidate. 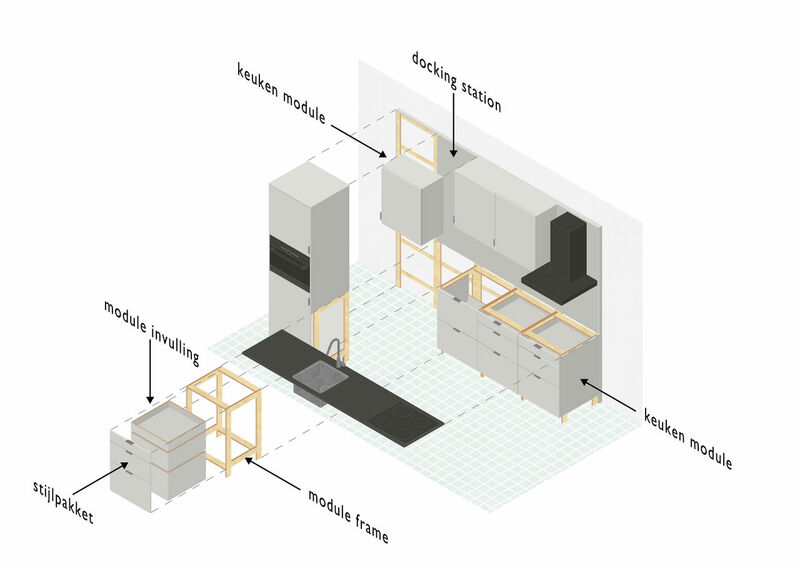 The circular kitchen prototype will remain in place in the Faculty of Architecture and the Built Environment in the years ahead for use by students and staff. “This will put the resilience of a kitchen of this kind to the test from the outset,” laughs Gruis. The kitchen will be further developed with a European grant from EIT Climate-KIC. You are warmly invited to attend the presentation of the prototype on Thursday 17 January. The prototype of the circular kitchen will be presented to interested parties from 14:30 to 18:00. The presentation will take place in the Faculty of Architecture and the Built Environment at TU Delft. You can register for the presentation by contacting TU Delft Science Information Officer Ilona van den Brink: i.vandenbrink@tudelft.nl, +31 6 81833671.